It is very easy to display my Computer as a Menu in Windows-7 or Windows-8 Start-Menu! Open the Customize Start-Menu Window via right mouse button click on an empty area in the Task Bar! Please open Taskbar Properties. Click "Properties" [... see Image 1 Arrow-1] (in context-menu). option "Display as a menu" [... see Image 1 Arrow-4] . 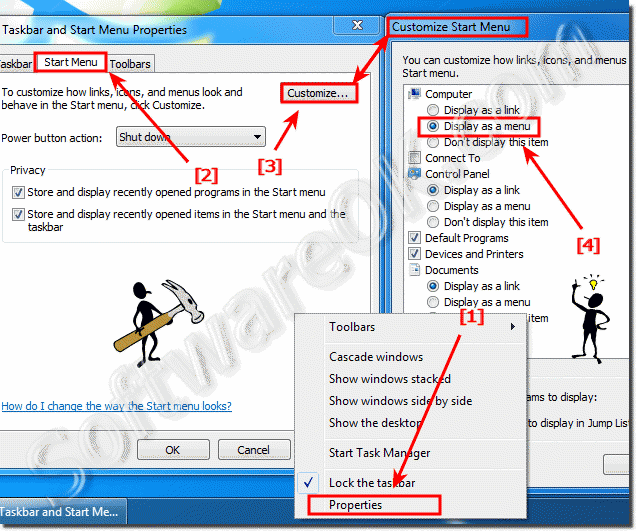 Windows-7 - FAQ-66: How to display my Computer as a menu in Windows-7 start menu?